Many of the world’s biggest insurers, including AIG, Munich Re and Zurich, are undermining global climate goals and Indigenous rights by supporting the tar sands industry, reveals a briefing paper by the Unfriend Coal campaign released today. NGOs supporting the campaign have also written to CEOs of the world’s largest insurance companies, meeting in Paris this week, calling on the industry to divest from coal, tar sands and associated pipeline projects and cease providing insurance cover to these climate-destroying fossil fuel projects. Extracting and processing tar sands in Canada’s Alberta province, which controls more than 70% of global reserves, on average creates 2.2 times more carbon emissions per barrel than other North American crude oil.The Canadian government projects that tar sands extraction in the province will grow by 77% by 2040. New tar sands mines and the associated pipelines also ravage boreal forests and watercourses, and violate Indigenous rights. Entitled, Heads in the sand? The insurance industry, tar sands and pipelines, the briefing paper finds that under current market conditions, the proposed expansion of tar sands extraction depends on the construction of new pipelines to refineries and ports. The proposed Trans Mountain Pipeline Expansion project in Western Canada for example would transport 590,000 barrels of tar sands per day, unlocking an estimated 130 million tons of CO2 emissions per year for decades to come, violating Indigenous rights and creating massive threats to ecosystems and public health. The briefing paper, co-published by Greenpeace US and Rainforest Action Network, names 25 insurance companies which Kinder Morgan, the developer of the Trans Mountain Pipeline Expansion project, has disclosed it has done business with in the past. In recent years, at least 17 major insurers have divested an estimated $23 billion from coal companies and five large insurers – including industry giants AXA and Allianz – have stopped insuring new coal projects or are about to do so citing concerns about climate change. 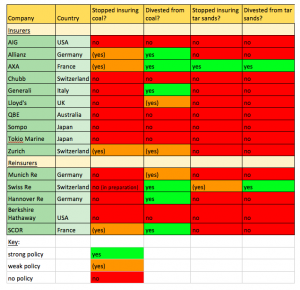 So far only AXA has stopped insuring tar sands and the associated pipeline projects and divested Euro 700 million from the respective companies, while Swiss Re has stopped insuring new (but not existing) tar sands projects. Major insurance companies which continue to insure coal and tar sands include Munich Re, AIG, Generali and Lloyds. Scale up investments in clean energy companies and insurance coverage for clean energy projects that follow international human rights, Indigenous rights, social and environmental standards. The CEOs of the 80 largest insurance companies are meeting in Paris from May 30thto June 2ndfor the annual meeting of the Geneva Association, an insurance industry think-tank. The Association Board rejected a request from the Unfriend Coal campaign to meet the NGOs to discuss their concerns. Ahead of the meeting, the Paris city council called on the world’s biggest insurers to end support for the coal industry, citing its impact on climate change and the pollution that causes nearly 23,000 premature deaths across Europe every year. The Unfriend Coal letter was signed by 350.org, the Center for International Environmental Law (USA), Divest Invest (USA), the Foundation Development Yes Open-Pit Mines No (Poland), Friends of the Earth France, numerous Greenpeace country offices, the Japan Center for a Sustainable Environment and Society, Market Forces (Australia), the Rainforest Action Network (USA), the Sunrise Project (Australia), Re:Common (Italy), and Urgewald (Germany). The Unfriend Coal campaign brings together a global network of NGOs and social movements calling for insurance companies to divest from and cease underwriting coal and support the transition to clean energy. The campaign is supported by 350.org, CIEL (US), ClientEarth (UK), Foundation Development YES – Open-Pit Mines NO (Poland), Friends of the Earth France, Greenpeace Switzerland, Market Forces (Australia), Rainforest Action Network (US), Re:Common (Italy), The Sunrise Project (Australia), Urgewald (Germany) and the Waterkeeper Alliance (US), among others. The insurance companies are: ACE (meanwhile operating under the Chubb brand, Switzerland); AIG Cat Excess (USA); Alterra (part of Markel, USA);Amlin (Lloyd’s syndicate, meanwhile acquired by Mitsui Sumitomo, UK/Japan); ANV (Lloyd’s syndicate, part of AmTrust Group, UK/USA); Arch (UK/Bermuda); Argo (Bermuda); AXIS (Bermuda); AXIS (USA);Endurance (meanwhile acquired by Sompo, Bermuda/Japan); Great Lakes (part of Munich Re, Germany); Ironshore (meanwhile acquired by Liberty Mutual, USA); Ironstarr (Bermuda); Lancashire (UK); Lexington (part of AIG, USA); Liberty International (part of Liberty Mutual, USA); OCIL (Bermuda);O’Farrell (Lloyd’s syndicate managed by QBE, UK/Australia); SCOR (France); Starr Surplus Lines (USA); Swiss Re (Switzerland); Torus (meanwhile acquired by Enstar Group and rebranded as StarStone, UK); Westchester (meanwhile acquired by Chubb, USA/Switzerland); XL Insurance (meanwhile under acquisition by AXA, Bermuda/France); and Zurich (Switzerland). The letter was addressed at the CEOs of AIG (USA), Allianz (Germany), Aviva (UK), Axis Capital (USA), AXA (France), W.R. Berkley (USA), Berkshire Hathaway (USA), Chubb (Switzerland), Generali (Italy), Hannover Re (Germany), Legal & General (UK), Liberty Mutual (USA), Lloyd’s (UK), Mapfre (Spain), MetLife (USA), Munich Re (Germany), Prudential (USA), QBE (Australia), SCOR (France), Sompo (Japan), Swiss Re (Switzerland), TIAA (USA), Tokio Marine (Japan), XL Group (Bermuda), and Zurich (Switzerland). These companies overlap with but are not identical with the companies which have in the past insured Kinder Morgan. The Unfriend Coal campaign defines coal companies as companies which depend on coal for more than 30% of their business, produce at least 20 million tons of coal per year, or operate at least 10 GW of coal power stations. It defines tar sands companies as companies which hold at least 20% of their oil reserves in tar sands. The campaign will tighten these definitions over time.